PurgEye 100 the newest, most advanced Weld Purge Monitor™ with new features and capabilities that place this monitor way ahead in the field of weld purge monitoring. The Argweld® product line is the only one to offer a complete “family” of Weld Purge Monitors™ for all applications and to suit every budget. With the addition of the exciting new PurgEye 100, the industry’s most popular line of purge monitors has raised the bar even higher with the latest in instrumentation and advances in technology. The innovative Push Button Auto Calibration on the front of the PurgEye 100 allows the user to calibrate at atmospheric level and again at the lowest oxygen reading with just the push of a button and provides increased accuracy. 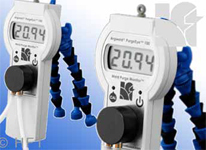 Another ‘first’ in the design and manufacture of PurgEye 100 Weld Purge Monitors™ is the low battery indicator that appears in the corner of the screen at the appropriate time. With mounting the instrument on a tripod, easy visual observation is provided so you can see the PurgEye 100 Weld Purge Monitor™ from any part of the working space. A range of tripods or other fixing devices is available on which you can mount and station your PurgEye 100. A rugged tripod mount has been integrated into the housing, which allows the PurgEye 100 Weld Purge Monitor™ to be firmly mounted on a tripod of your choice. The PurgEye 100 Weld Purge Monitor™ is shipped in an attractive, robust carry, presentation and storage case to maintain the instrument in good condition and to keep it together with all accessories. The PurgEye 100 Weld Purge Monitor™ can be used with any pipe welding system, any weld purging chamber or weld purging enclosure. The sensor is easy to replace and self calibrate using the advanced calibration features of the PurgeEye™100 and the specially written algorithm that provides extreme accuracy at 0.1% where it is especially important for weld purging. 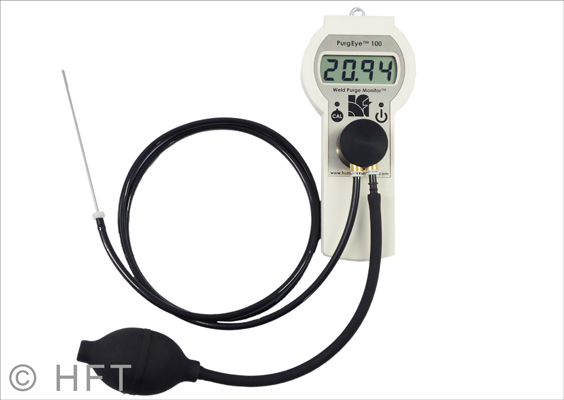 The PurgEye 100 Weld Purge Monitor can be used as a continuously reading instrument with free flow of the purge exhaust gas across the sensor, or as a sampling instrument with the hand vacuum pump and stainless steel probe assembly extracting samples from the purged volume, as and when desired. 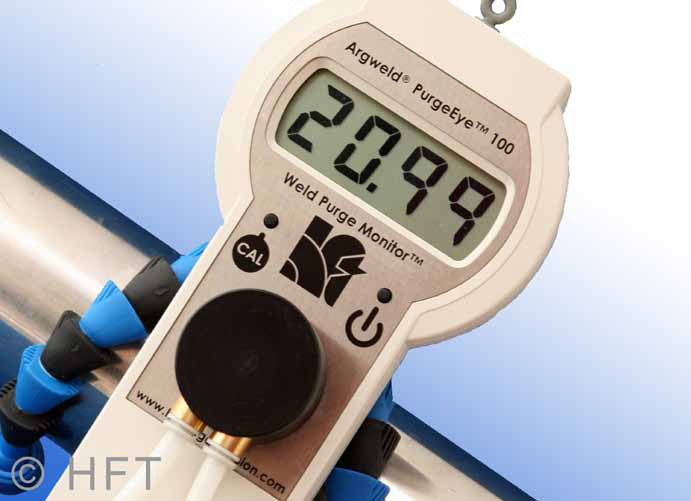 The PurgEye™ 100 Weld Purge Monitor™ can be used as a continuous measuring device throughout the process or as a sampling instrument for spot checks. 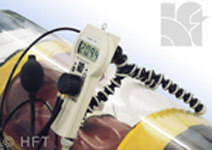 Visible demonstrations and routine inspections for quality control are made simple. The monitor can be used with any pipe purging system or argon welding enclosure. It is very compact and completely portable. Once the desired oxygen level is achieved, welding can begin.